On Saturday, we drove to the lake to gather boughs of fir and pine for our Christmas decorations. 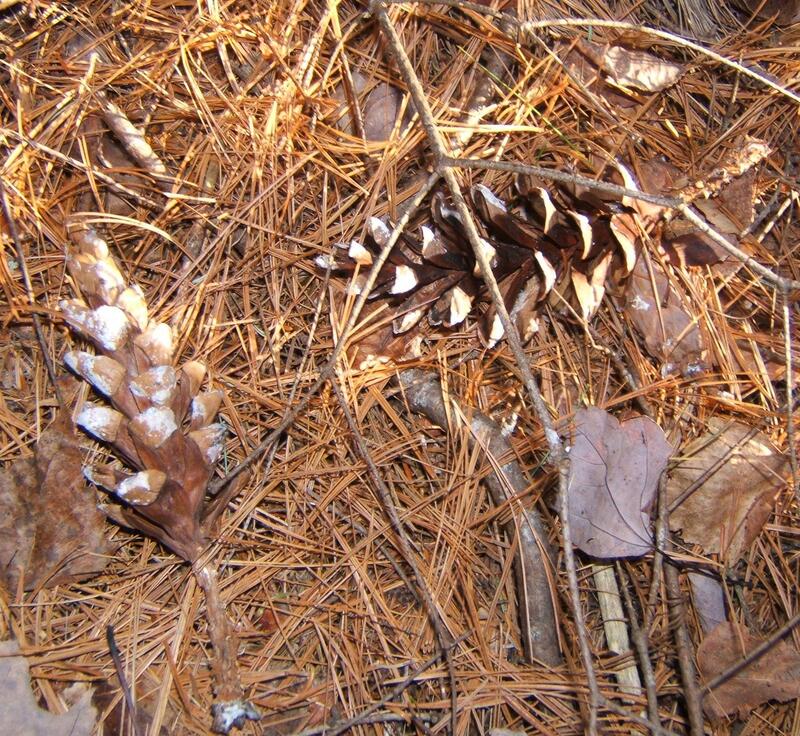 While we were there, we poked around in the thicket. 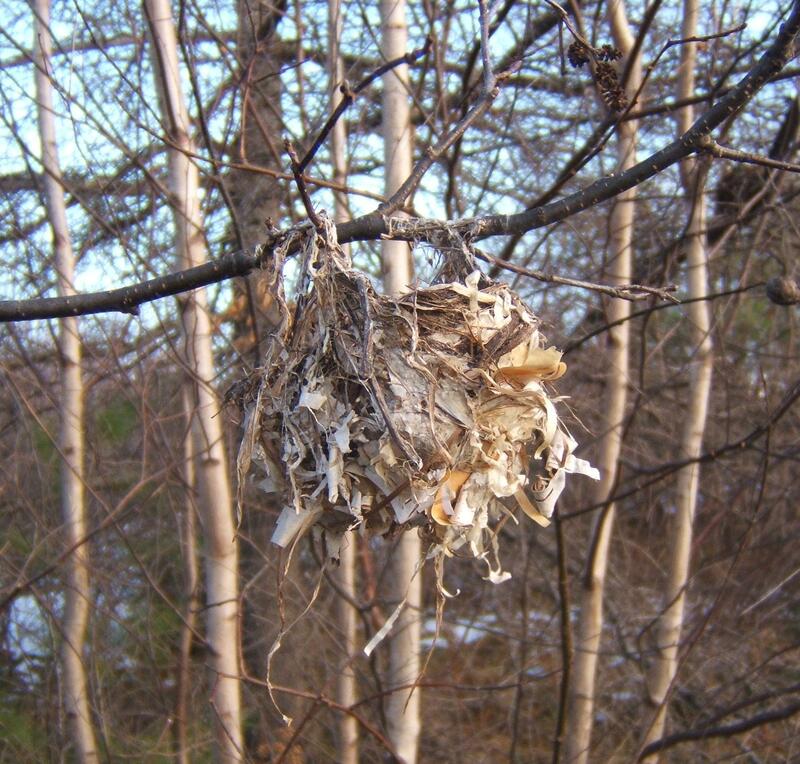 We found a few bird nests, still intact, easily seen now the trees and alders are free of leaves. 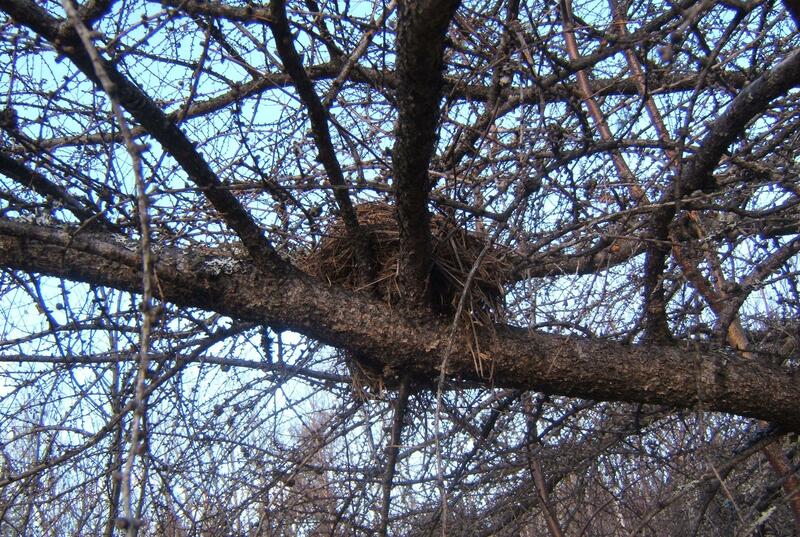 The first nest was cup-shaped, made of tightly woven grasses and weeds. Nests of songbirds are not easy to identify since they are similar in size and construction materials. If this little nest survives the winter, perhaps I can watch who uses it next spring. The second nest probably belonged to a Robin. It was high in a tamarack tree, welded firmly to the branches. Robins often return to the same area and sometimes use the nest of the previous summer, so I’ll be watching this nest too. The last nest we saw was a beautiful little hanging basket covered with birch bark and woven with grasses. It appeared to be frail but it was very sturdy and stubbornly clung to the bough in spite of its exposure in the November wind. I think it is the most delightful sight I have ever seen. 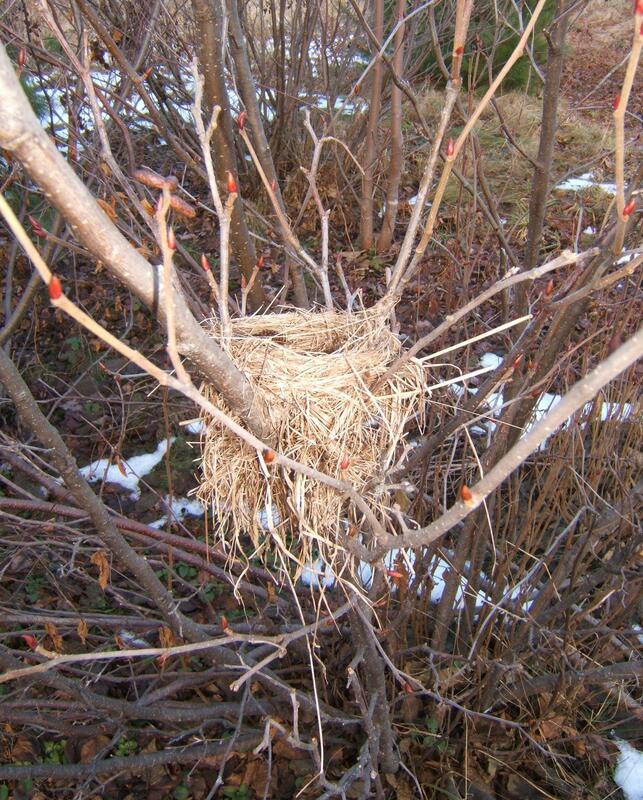 A biologist with the New Brunswick Department of Natural Resources was able to identify this nest from my photo. 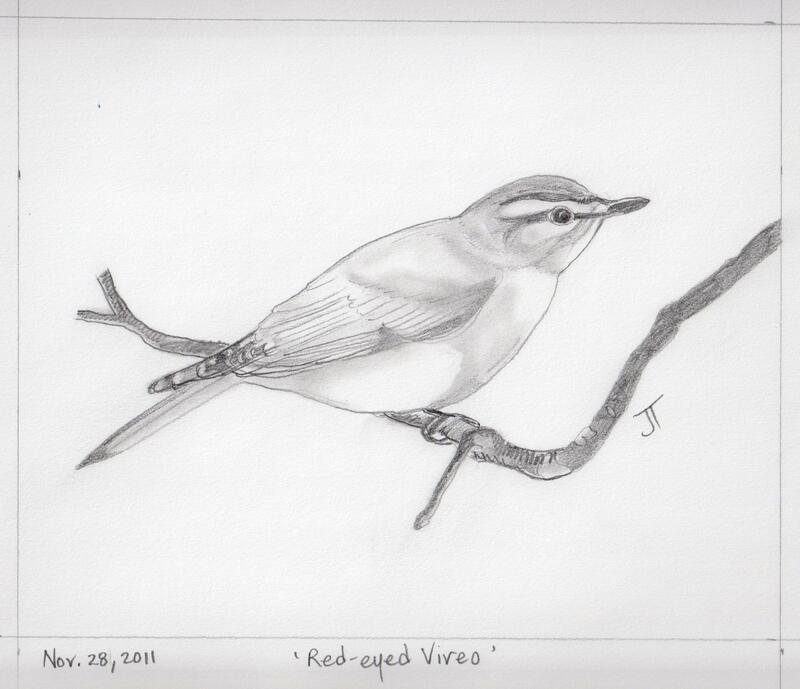 The nest probably belonged to a red-eyed vireo, one of our common songbirds. I have never seen this bird at our lake property, but we hear it all summer, endlessly asking its question and giving an answer. In the cold weather, I think about the waterfalls we saw this summer. As the temperature gets lower, they succumb. First the water freezes at the edges, building up on the rocks and ledges. Then, gradually icicles build and the surface water freezes. By mid-winter, the waterfall will be a frozen cataract, a glass house of ice. Within the frozen falls are ice caverns and icicles, places where water runs and where water stands still, and places where the ice traps sunlight to shimmer and sparkle. One of the waterfalls we visited this summer was Smith Falls (see ‘niche beneath waterfall’ under the category ‘waterways’, published October 21, 2011). At the base of the waterfall was a small cave. In winter, the entrance to this cave must be a crystalline curtain of icicles and glass. 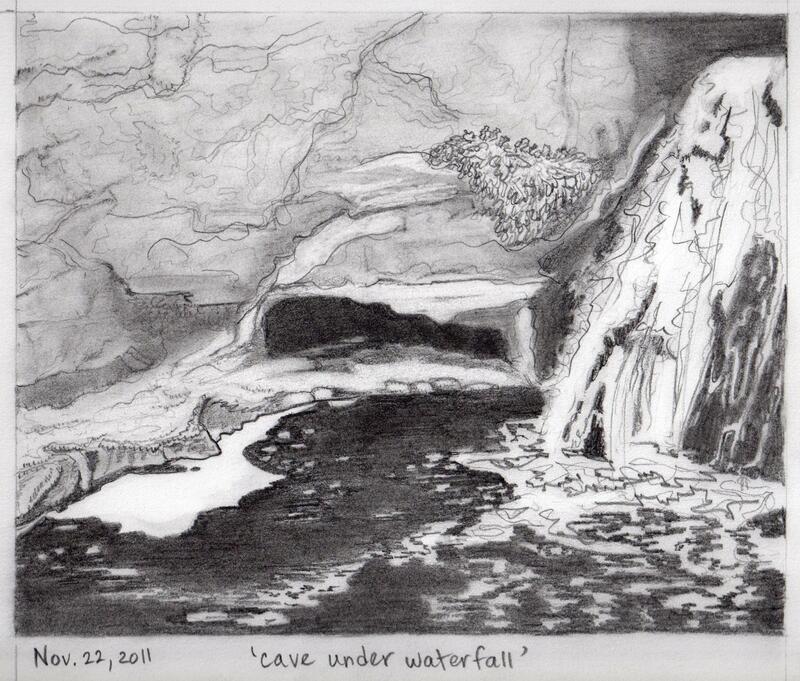 Below, in my poem and drawing, I remember the cave and waterfall in summer. Again, I am in competition with the squirrels (see ‘competing with the squirrels #1 and #2’, in the Category ‘competing for niche space’). Christmas is coming and this year, I am decorating with natural elements. One of these is a ceramic bowl of large pine cones. 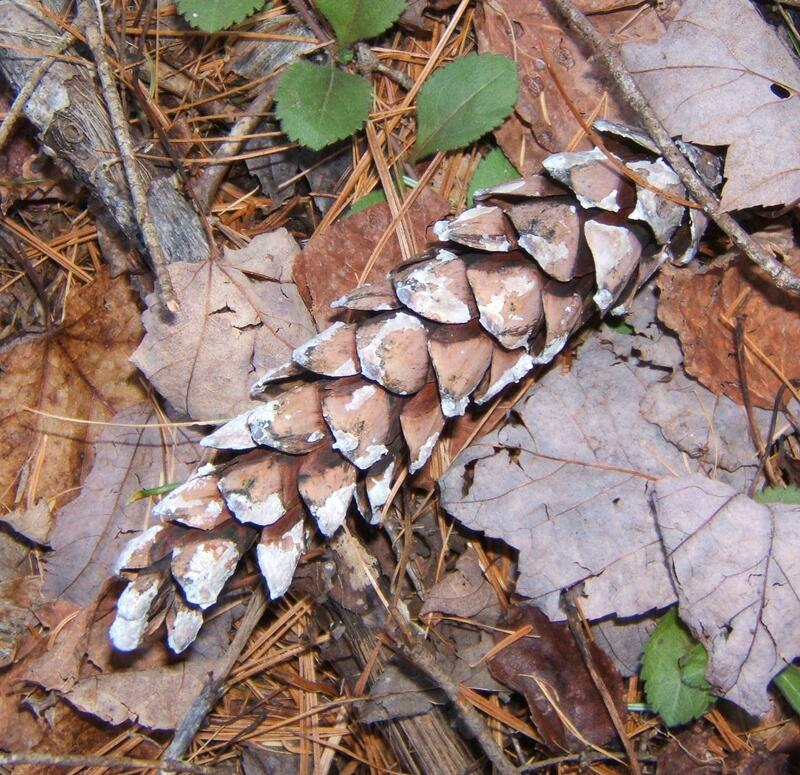 We have several large White Pine (Pinus Strobus L.) on our property and from time to time, they produce masses of beautiful pine cones, perfect for my decorations. 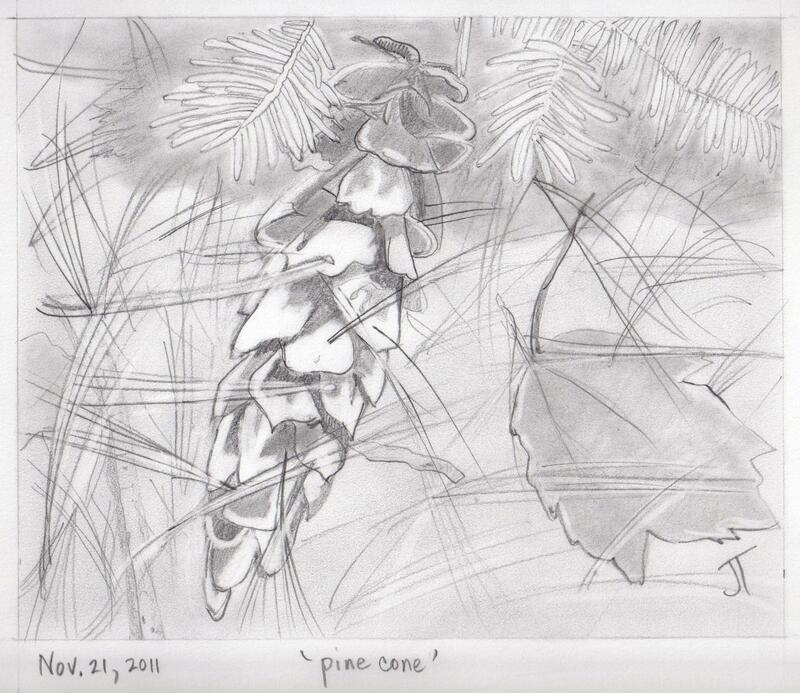 White Pine are easy to remember in this area, since they have their needles in bundles of five. The cones are between 10 and 15 cm long and are a favourite food for squirrels. My husband came in last weekend and announced there were lots of the big cones in the pine tree next to our lawn. “Watch for them to fall, and then you should hurry to collect them,” said my savvy husband (he remembers the sad tale of the ripening hazelnuts). Of all the birds, I like the American crow (Corvus brachyrynchos) the best. For one thing, they seem to me to be full of personality. I also know that crows are intelligent – research shows they can distinguish humans from one another by facial features. Crows also stay in family groups (parents and fledged offspring) for a few seasons. I feel sorry for crows; they seem to have a bad reputation and are treated poorly as a result. If you want to learn more about crows and their habits, have a look at Michael Westerfield’s new book “The Language of Crows: The crows.net Book of the American Crow,” available at www.crows.net/crowbook.html . A group of crows is known as a ‘murder’ of crows. The term ‘murder’ refers to the ‘observation’ that a group of crows will kill a dying cow. Some people are advocating for an alternative, since the term ‘murder’ perpetuates the notion of crows being malicious. 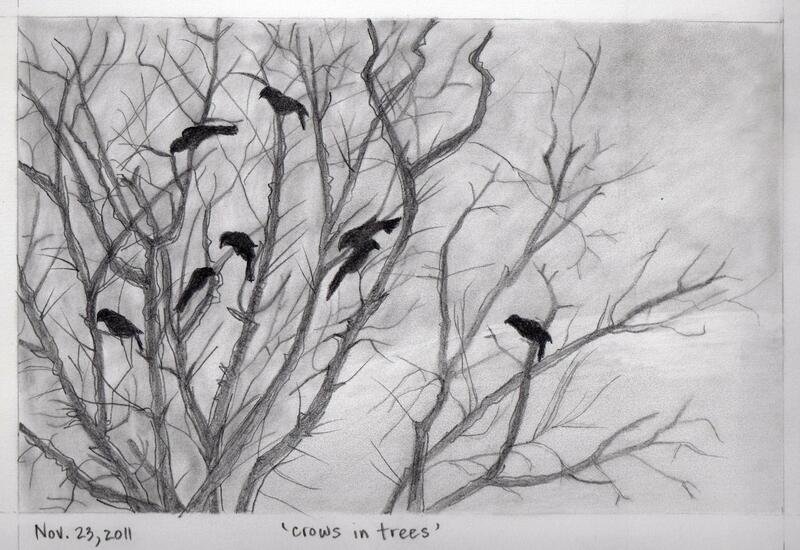 Alternative names for a group of crows are presented in http://www.crows.net/mjw.html Michael Westerfield’s Crow Log: The Crows.net Project. I think this is an opportunity for a Poll! 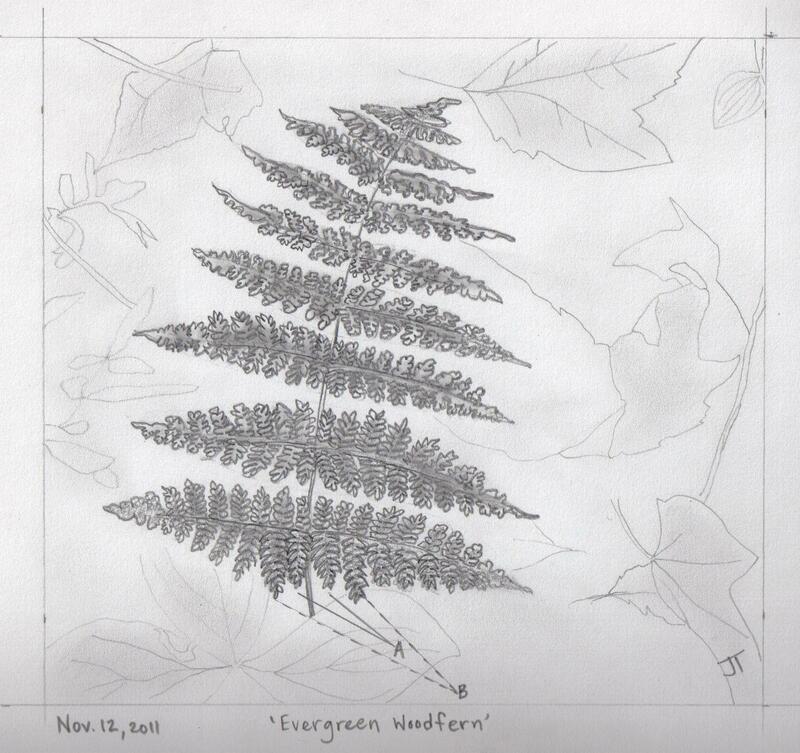 On Sunday, I looked for and found my first November fern! Since we had about 25 cm of snow yesterday, I may have found my only fern of the winter! 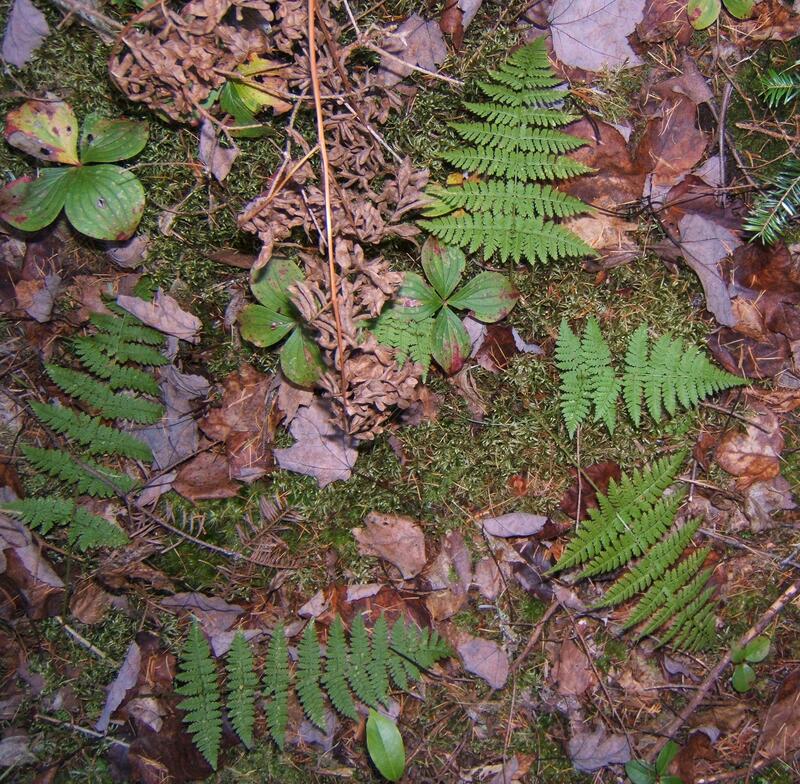 The fern I found is an evergreen fern, pressed close to the earth this time of year. 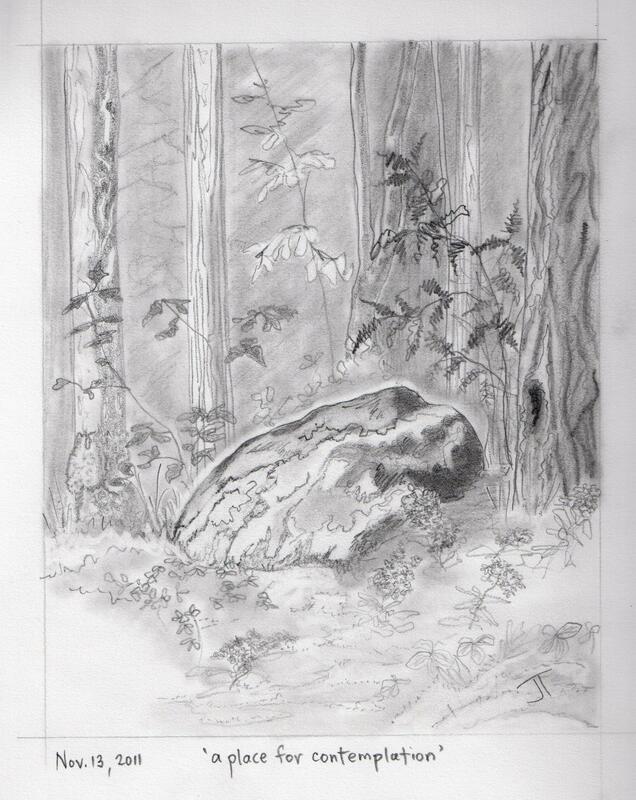 For me, identifying ferns is always a challenge. 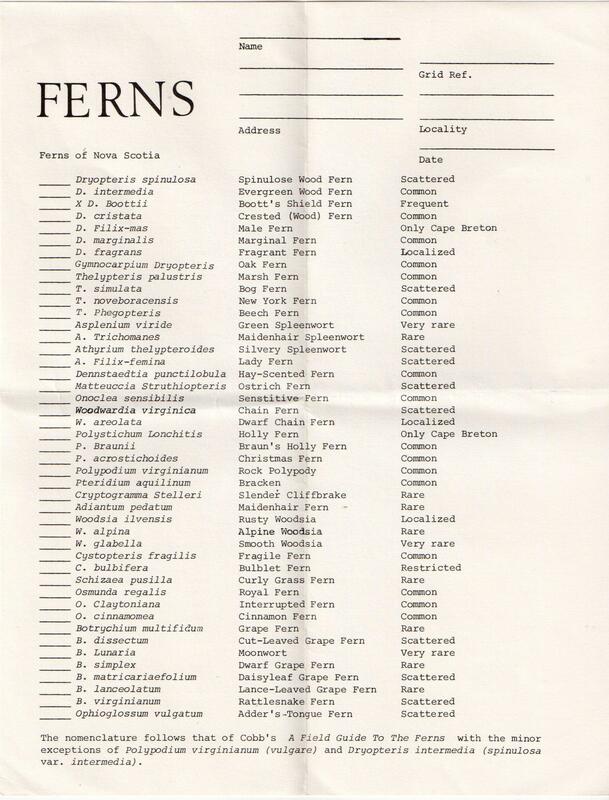 I use the Peterson Field Guide, ‘A Field Guide to the Ferns and their Related Families’ by Boughton Cobb, 1963. Then I turn to a very helpful website www.ontarioferns.com . With patience and careful attention to some key features, I can usually figure them out. the lowest pair of inside subleaflets (next to the stem) of the lowest leaflet are slightly shorter than the second subleaflets next to the stem (if you look closely at the photo above, this feature is hard to see due to the camera’s perspective – the best example is the fern at the upper right). This fern is the Evergreen Woodfern (Dryopteris intermedia), closely related to and difficult to distinguish from the Spinulose Woodfern. Crisp November nights are a perfect time for a quick look up at the stars. I’ll be including some posts about our star-gazing, but for now, my thoughts are still turning back to summer. Stars in the sky? There are also stars in the dark summer woods. The American Star-flower, Trientalis borealis Raf., is a plant with a delicate white, star-shaped flower, found in late spring in woodlands and on peaty slopes. Its scientific name comes from the Latin word for the third part of a foot, a reference to the height of the plant, and the Latin borealis, meaning northern. It is a common little plant, described by Fernald as a “forest pioneer”. Some will wonder what the ‘Raf.’ refers to, at the end of the scientific name. This is an attribution to the botanist who first named the plant. In many cases, the attribution is ‘L.’, meaning the plant was first named by Carolus Linnaeus (the biologist who first introduced the ‘binomial’ naming system for plants). ‘Raf.’ stands for Constantine Samuel Rafinesque-Schmaltz who first assigned the genus and species names to the plant – Trientalis borealis. He was an eccentric polymath (knowledgeable in many fields and disciplines) who lived from 1783 to 1840. In his lifetime he published 6,700 binomial names for plants. 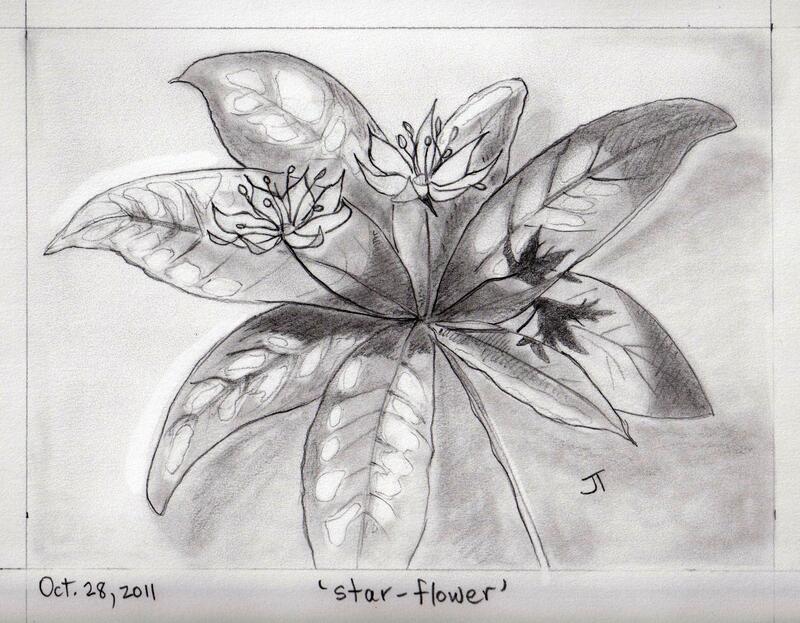 Published as: ‘Star Flower’, Winter 1993, The Antigonish Review 92. In eleventh century Sweden, rune stones were often raised by landowners as a memorial of their accomplishments. Jarlebanke was a landowner and a local magnate who lived in Uppland, Sweden during the second half of the eleventh century. He took pains to ensure he would be remembered, and six stones survive of the many he ordered to be carved. Four of the surviving stones stand at the ends of the Täby bru. The Täby bru is a ‘bridge’ or causeway marked with two rune stones at each end.